Washington, D.C., September 12, 2007 -- The Ron Paul for President campaign announced today it had hired Roy R. Schecter, a widely vilified international purveyor of spam email, to bolster its seemingly unstoppable grass-roots Internet campaign. A spokesman for Ron Paul said Schecter, 26, will take charge of coordinating the campaign's innovative Internet marketing efforts. Washington, January 14, 2007 -- Prior to the November 7 midterm elections, many political analysts wondered how President Bush would handle the last two years of his presidency if the Democrats seized control of the Congress. Nearly all agreed it would be a lonely time for a President accustomed to being surrounded by friends in Congress. 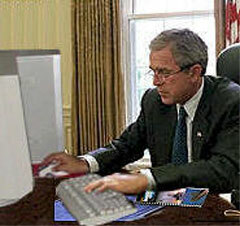 None of the analyst's observations included the possibility that President Bush would retreat from the world stage to the world of online gaming. Wikispace, December 19, 2008 -- Outgoing President George W. Bush was caught yesterday attempting to polish his biographical entry on Wikipedia, sources close to the reclusive commander-in-chief admitted. The effort was immediately spotted by members of Wikipedia's large group of volunteer editors, who described President Bush's revisionist online foray as "comically inept". Washington, D.C., September 22, 2006 -- Investigators with the FCC announced today they have conclusively determined the White House to be the source of the chatty pro-Bush and pro-Republican "issue emails" that clogged an estimated 164 million American email inboxes last week. While the rules regarding unsolicited political email are even fuzzier than those detailed in the CAN-SPAM Act regulating commercial email, a spokesman for the FCC did not rule out the possibility that criminal charges would be pursued. Mountain View, CA April 23, 2008 -- Nearly everyone has misplaced their keys, wallet or cell phone. Everyone has had at least one sock come up missing after the laundry has been completed. At least once a week one of the many remote controls is not where it is supposed to be. 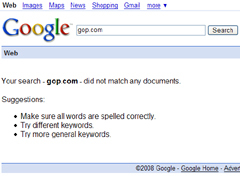 The people at Google Labs have now come to the rescue of us all with Google's latest application: Where To Find (WTF).